The plan was for me to call my ISP, which is Globe Broadband, and ask them to add a wireless router to my service plan wherein I’ll just pay P350/month for 3 months for the device and enjoy wireless connection at home. However, due to the irritating power outage that we are experiencing daily, I can no longer afford to loose my internet connection especially when I am working online. (I still haven’t finished the tasks I’m supposed to finish due to the toxic loads I have at work. Hopefully I’ll be able to accomplish my pending deliverables this weekend). So off I went to the malls before I went to work and headed to National Bookstore to buy the kit. They have this raffle contest to win a trip to 3 summer destinations here. The bad thing was they ran out of stocks. 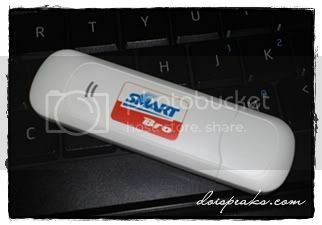 So I headed to the closest SMART Business Center in SM where I bought the Smart Bro Prepaid Kit. 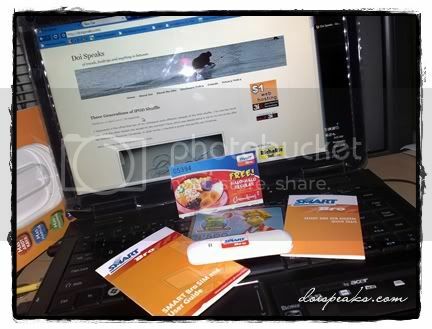 I’m still planning to get a router though, or else, I might convert the SMART Bro Prepaid Plug-it into a post paid plan. They have this 2-year lock in contract if I do that. However, they also sell a SIM which has a 6-month lock in contract. I guess I’m better off with the 6 months rather than be stuck with the 2 years. For now, I’ll be waiting for the next power outage and I’ll be ready! Hopefully the battery of the borrowed laptop won’t die on me. Ultimate goal. Save money to buy me a netbook or a laptop 😉 anah!